During a monthly community hike one of the jobs of staff and volunteers is to guard kennels when we have guests on the property. Basically the job is to ensure that no guest crosses the rope and attempts to touch one of the animals. 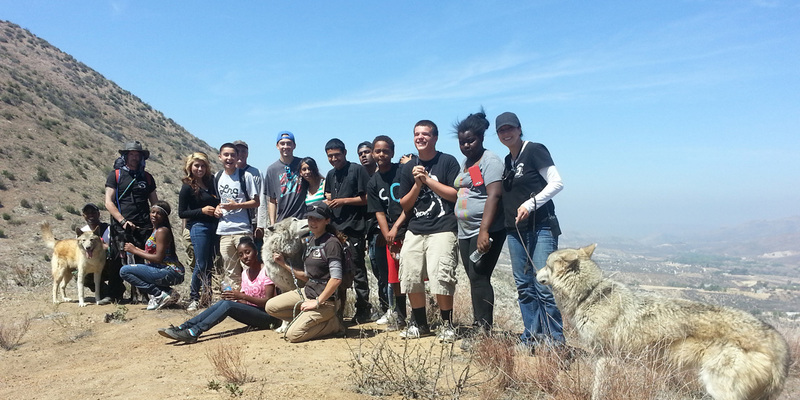 One particular guest attended a few wolf hikes. She never crossed the boundary of the ropes but she did manage to touch one of our animals…. The connection was evident. I almost hesitated to ask her to return to the main seating area with the other guests, who were waiting for the next tour to begin. There was something about the way she stood at a respectful distance and gazed at Max. I recalled that I had seen her at the prior hike, with the same ritual of standing in front of Max’s kennel aduring my gentle request for all guests to move to the general seating area … and, Max? He actually looked relaxed. Then, during the hike, I spoke to her briefly and she mentioned that she had sponsored Max and would be returning soon to celebrate her birthday with Max and some of her family. That was the connection! 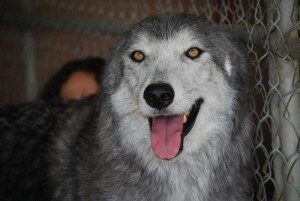 She shared that she couldn’t afford to sponsor him initially but then learned that she could set up her own crowd funding page at my.wolfconnection.org and donate her birthday to Wolf Connection. Through the generous support of family and friends she managed to raise enough funds to sponsor Max! 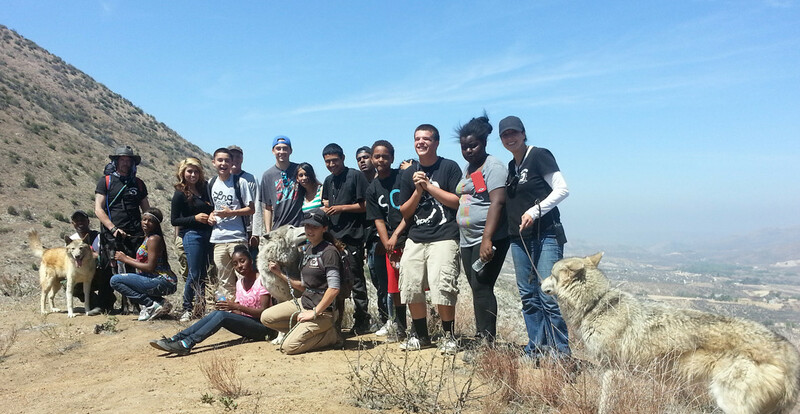 With sponsorship one receives additional perks like a private tour of the ranch, bonding time and much more. This new sponsor chose to spend her birthday with her family and with Max! And Max? When she arrived for her birthday, she was brought over to his kennel to greet him through the fence. Tentative with new people, Max observed her from a distance. During the private hike, after bonding by walking together, when the group stopped to rest, Max approached his sponsor and presented her with his side, showing trust. Soon after, he also presented her with sniffs and a few kisses as well. Thanks to her, not only was Max sponsored for a few months, he was also assisted in his own healing by the opportunity to connect with her and to experience trusting someone new. Their special bond was evident. 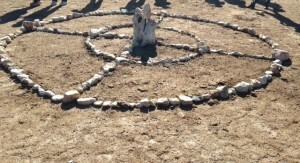 Gratitude for everyone who donates time, money, items, connections and good wishes. We are blessed! As any pet owner knows, you need to be prepared for an emergency evacuation, especially in Southern California where fires and earthquakes are common. For those who have a cat, dog or any pet, a plan for those emergencies is very necessary. However, imagine if you had to transport over 30 wolves in an emergency? 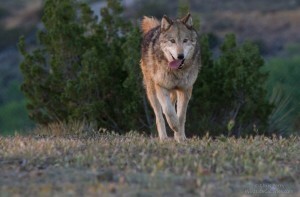 With the well-being and safety of the wolf pack as our number one priority, the team at Wolf Connection is ready! It all started with a 24-foot flatbed trailer that had been donated to us. Teo Alfero, Executive Director and Founder, sketched out an idea on how to turn the donated flatbed into a fully functional evacuation trailer. Photo Credit: Chris Perry at Wildside Galleries | Image: Wolf Connection’s Resident Artist, Genevieve Mariani, drew the Evacuation Trailer design and is teaching Youth Empowerment participants how to paint a mural. To see more of Genevieve’s work visit her Facebook page. Of course, bringing the idea to reality would take funding, which is when Cate Salansky, Lead of Grants and Donor Relations, applied for a grant from The Mary Jo & Hank Greenberg Animal Welfare Foundation for the specific purpose of creating, designing and building a custom evacuation trailer that would suit the needs of the pack. The Mary Jo & Hank Greenberg Animal Welfare Foundation is located in Los Angeles County and their purpose is to give primarily to organizations that rescue, provide care, housing and services for homeless and neglected animals. 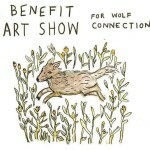 This collaboration was a perfect fit, so much so that Wolf Connection received a $10,000 grant! With funding in place, the Wolf Connection Leadership Team turned to local Eddie Moreno and showed him their sketch, asking Eddie to turn their idea into a reality. The result is a fully equipped, customizable evacuation trailer. 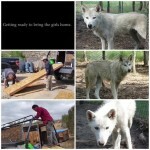 The trailer has 18 kennels, which can house two wolves each if needed. 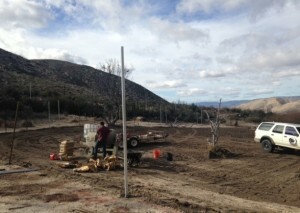 Additionally, there is storage for food, water, bowls and other supplies that are always kept fully stocked and fresh. 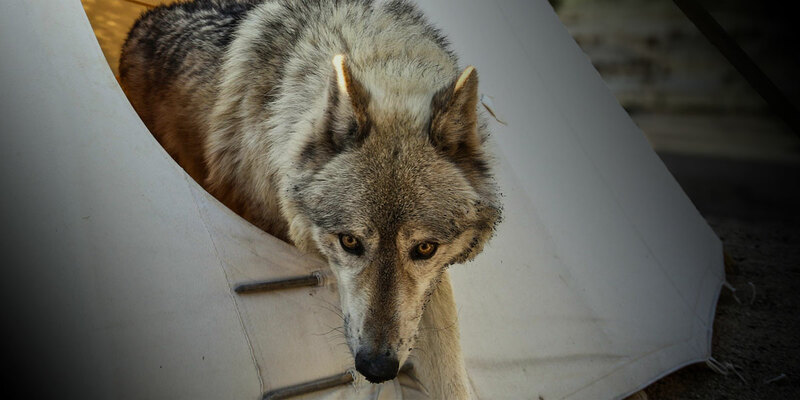 The trailer is packed with a carport tent that can be put over the kennels to shade the pack from the sun and hooks are placed around the outside of the trailer so that the wolves can be taken out of the kennels on leashes to stretch their legs. The trailer’s functionality is significant as it is fully customizable and kennel sizes can be changed as needed into multiple configurations. For example, by removing and altering panels, a kennel that is 4’ x 4’ x 3.3’ can become as large as 8’ x 3’ x 3’. This customization is perfect for when a small group of wolves need to be transported, allowing them ample room for their trip. With the evacuation trailer ready all Wolf Connection needed was a plan. 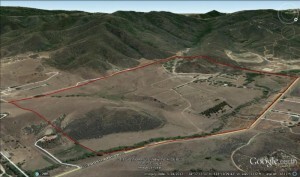 The USDA requires the ranch to maintain an evacuation and emergency plan including training of all staff on the procedures. Wolf Connection is taking it one step further and actually training the wolves as well. 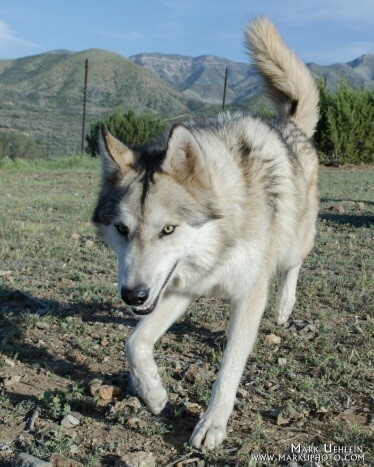 The wolves are brought to the trailer, trained to jump in and out of the kennels and go on short rides. This is to expose them to the process, so, if and when an emergency arises, their familiarity with the trailer will minimize their anxiety and the time required to evacuate. The trailer is always kept at the compound and ready to go. In the event of an emergency, the entire pack can be transported with the trailer safely and quickly to an agreed upon evacuation point. If, for some reason, we cannot get to the agreed upon evacuation point, we are fully stocked and prepared to take the pack anywhere to keep them safe. 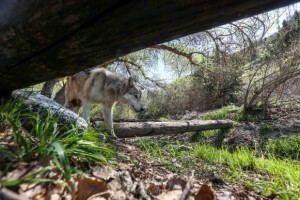 Photo Credit: Wolf Connection | Image: The Wolf Connection Evacuation Trailer is complete! Quite frankly, we at Wolf Connection believe the evacuation trailer is one of the best any rescue group could hope to have. 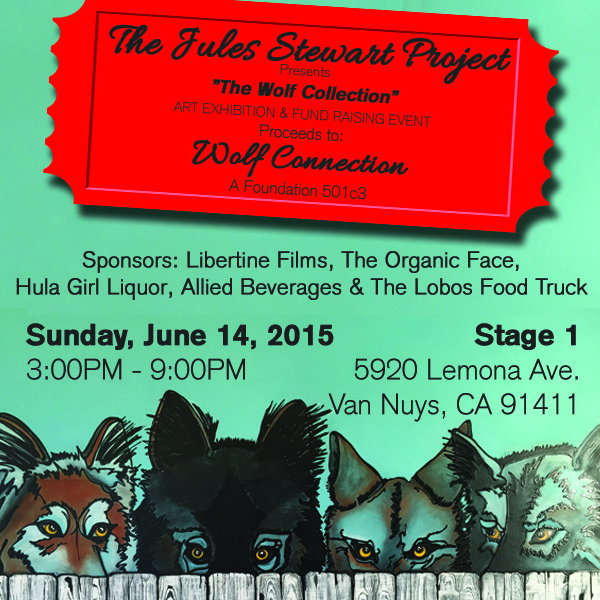 We are extremely honored and blessed for the grant from The Mary Jo & Hank Greenberg Animal Welfare Foundation, for Eddie Moreno turning the idea into a reality and for the contributions of the entire Wolf Connection team to create this amazing trailer and their commitment to the safety of the pack. 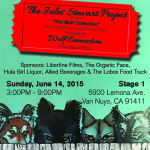 At Wolf Connection, we are thrilled and proud to be a part of the award winning film Medicine of the Wolf created by Julia Huffman. The wolf is known to be the most misunderstood creature on the planet. The purpose of the film is to bring to the forefront of people’s hearts and minds the intrinsic value of the wolf, both ecologically and spiritually and to shine light on this urgent time for wolves as a critically endangered species. Julia’s hope is that viewers will fall in love with the main character, world-renowned environmentalist and National Geographic photographer Jim Brandenburg. Questioning the rationale of wolf hunts, the film features captivating testimony from Jim who has studied and been on the ground with wolves for 45 years—longer than anyone in history. Julia became aware of Wolf Connection during the early stages of filming. 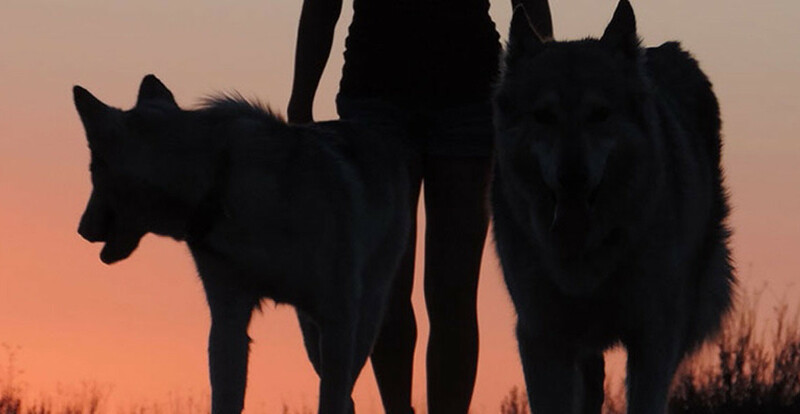 After a visit to the ranch and witnessing first-hand the reverence we have for our wolves and wolf dogs, she realized immediately Wolf Connection and its mission needed to be included in the film. 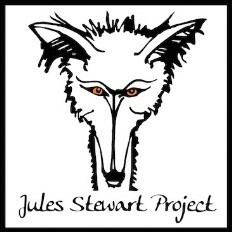 With the focus of the film on teaching people about the true nature of wolves and informing them wolves are no longer protected under the Endangered Species Act and are now being sport hunted across the US, Julia needed to give the audience something to hope for. 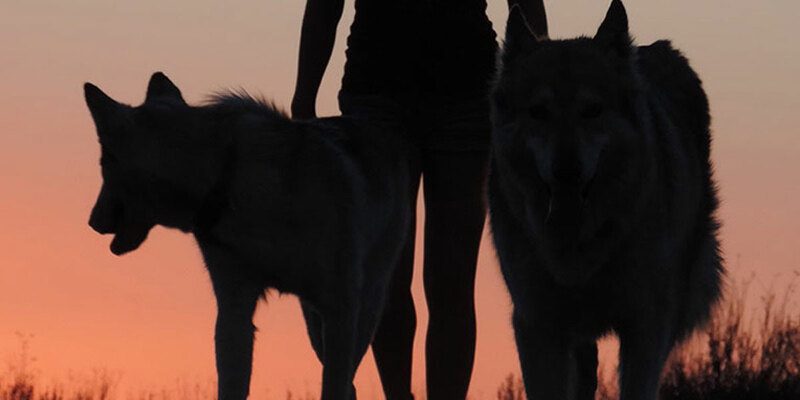 This is the role Wolf Connection and the pack play in the film; to lift the audience and give them hope. 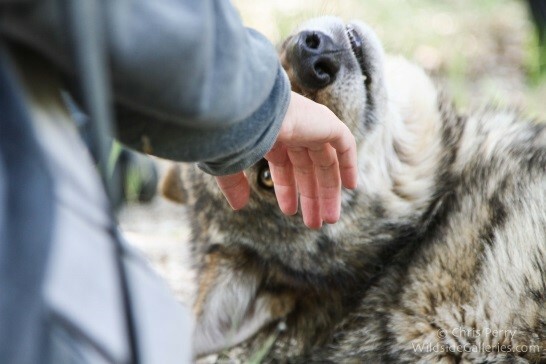 The crew taped several times at Wolf Connection and shows people interacting with the pack. These clips present the true nature of wolves and help to dispel the rhetoric and myths still so prominent in people’s minds. 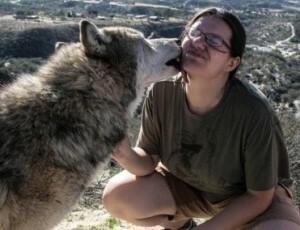 Wolf Connection’s founder Teo Alfero was interviewed in the film as well as staff including a clip of Ben, a Youth Empowerment participant, getting wolf kisses from Miko. In the sequence Ben is speaking about the delisting of wolves and every time he starts to speak of his concerns, Miko just keeps kissing him. This has become a very beloved scene by audiences and for Julia this is one of the moments in the film where nothing needs to be explained, it is just felt. When asked what change she hopes the film will create Julia responds, “I want to elevate people’s consciousness to understand the expansive and crucial role that wolves play on our planet and with humans since the beginning of our own evolution. This kind of thinking and understanding of our interconnectivity to all things is a doorway to the healing of our planet and our own sprits. At Wolf Connection we couldn’t agree more. Medicine of the Wolf is an independent project, which has been partially funded by supporters on Kickstarter from all over the world and by winning the 1st place ACE grant from the Humane Society of the United States. Many artists have endorsed and given to the project, namely, James Taylor, Bonnie Raitt, Moby, Graham Nash, Michael Stipe and more! Medicine of the Wolf just got a distribution deal with Gravitas Ventures, the largest VOD distributor in the United States! The film will be released in Mid-October so follow Medicine of the Wolf’s Facebook page for announcements. 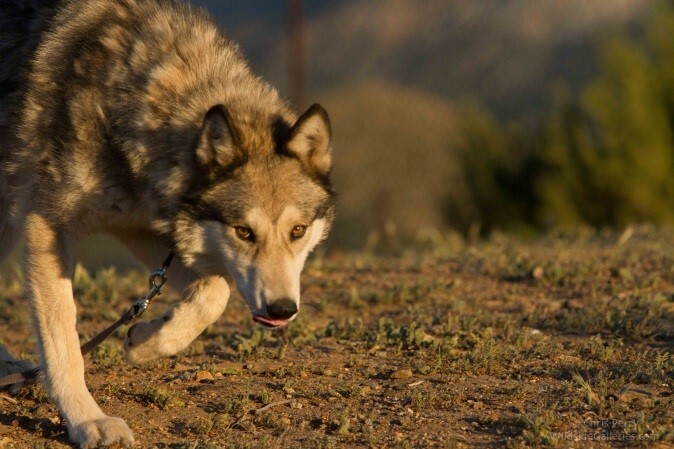 The goal is to use the film as an educational tool to get the conversation started about wolves and the important role they serve on the planet. If you would like to learn more about the film please visit their website www.MedicineoftheWolf.com and support the project by liking the Medicine of the Wolf Facebook page. Julia is an independent filmmaker and acting coach living in Los Angeles, CA. She is a writer, producer, director, and editor and recently won the 1st place Animal Content in Entertainment Award from the Humane Society for Medicine of the Wolf. Some of her past producing credits include HGTV, Steven Bochco Productions, and others. She also shot, edited and produced a short film The Rainbow Murders in 2008. Julia has a strong passion for animal advocacy, social justice and the environment. She grew up with parents who dropped out of the mainstream life and moved to rural West Virginia where she still has a strong connection to the land, she likes to call herself a child of the Revolutionaries. Wolf Connection’s unique Youth Empowerment Program is intriguing the nation, so much so that The Today Show sent NBC reporter, Craig Melvin, to the Wolf Connection Ranch to get a first-hand look at our groundbreaking methods and meet with graduates of the Wolf Connection programs. Watch the full report. 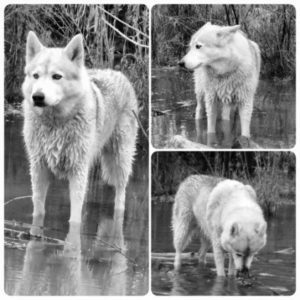 Zimba, one of Wolf Connection’s founding pack members, has always loved two things: people and water. Before finding their forever home at Wolf Connection, Zimba and his brother Rocky, with their outgoing and rambunctious personalities, kept their elderly human companion busy and sometimes overwhelmed. The boys loved to spend their days escaping from their back yard and running around the neighborhood making friends. They would voluntarily return home, scratch at the front door to be let in, assess the home front situation, and then promptly proceed to the back door and scratch to be let out, only to repeat the pattern over and over again. When their owner was no longer able to care for them, they were sent to Grandmother’s Rescue in the Mojave Desert. 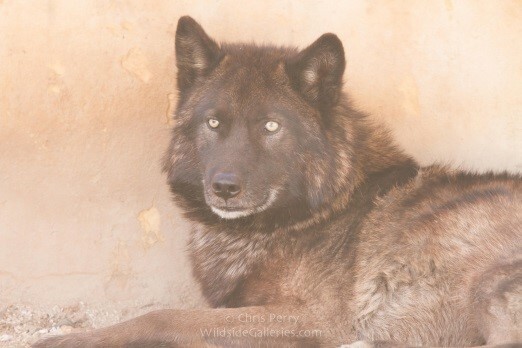 That sanctuary eventually closed, leaving sixteen wolves, including Zimba and Rocky, without a home and in need of rescue. That’s when Wolf Connection’s founder, Teo Alfero, stepped in to save these wolves. The inspiration to create Wolf Connection was born, in part, as Teo observed Zimba’s palpable love for meeting new people and spending time with young adults. Thanks to Zimba, what started as a rescue mission turned into a youth empowerment and education program that is intriguing people around the nation. 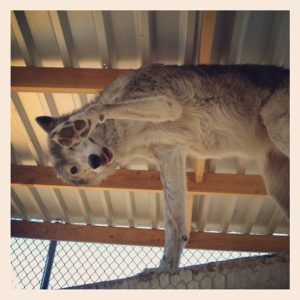 Zimba’s ease around people made him a perfect ambassador for the wolves and he quickly became one of the first and beloved program animals. 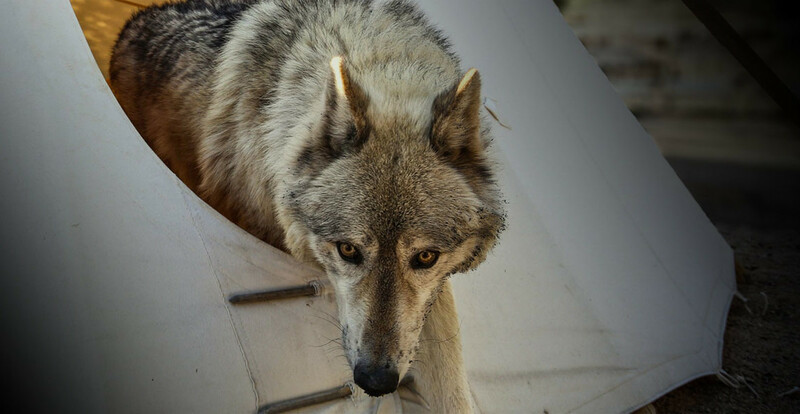 Since 2009, he has helped many at-risk kids discover their true potential and to embrace one of the key wolf principles—wolves are always ok with who they are. Zimba was born with certain physical ailments that have progressed as he has aged, necessitating his retirement from participating in programs. Zimba recently started exhibiting extreme pain in his abdomen and spine and was taken to the vet, where x-rays revealed that he has spondylosis, sometimes known as spinal arthritis. This condition can make touch to his shoulders, head and back very sensitive, causing him to want to avoid human contact. His teeth and gums have also been causing him pain, sometimes resulting in his refusing to eat. He is currently on a regimen of light daily exercise, special food, which has been helping tremendously, bone and joint supplements, and medications to control his pain and help with his deteriorating spinal condition. The catch 22 for Zimba is he does not like to take his medications, and he has let everyone know. The medications, in particular the pain meds, are necessary to maintain the balance of diet and exercise so needed to support the best possible quality of life for him. So, the Wolf Connection Pack Services Team has created meatball pockets to hide the medications and Zimba seems to like the attention and treats he receives for being a compliant patient. 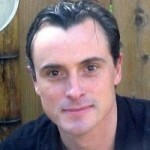 Although signs of age are settling in, his eating and exercise have improved on this regimen. In spite of his ailments, Zimba still loves to go on one-on-one walks with his favorite staff and perks up for these daily outings. Lately he even digs in his heels when his human companions believe walk time is over. Splashing in the creek and lying in the submerged cool water have always been favorite pastimes for Zimba. Now on these hot days you can often find him lounging in four or five inches of water in his own private kiddie pool, which is a recent addition to his living quarters, where he leads a more solitary life from the rest of the pack. His favorite staff often pamper him with a bath, gentle massage and other special treatments. 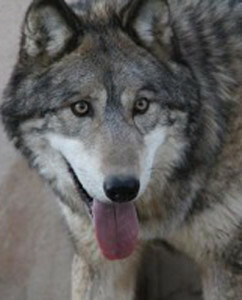 With soulful eyes, Zimba is truly a wolf to be adored and honored for his work as a wolf ambassador. Zimba is currently available for sponsorship and has yet to meet his new benefactor. Please consider sponsoring Zimba and his care in 2015 and, if you are nearby, come meet Zimba at Wolf Connection’s upcoming Community Hike, August 29, 2015. Written by Julie Bloomer, author of Gracie’s Tail: Conversations with DoG, available on Amazon or Barnes&Noble.100% of the profits from the sale of this book for the next year will be donated to Wolf Connection. People often ask us why wolves howl. The popular myth suggests that the lone wolf howls at the moon, just because it is full. This is not the case. 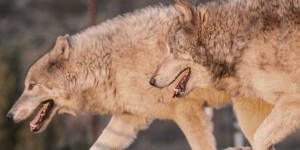 First of all, lone wolves will generally do not howl unless they are applying to a pack for membership or looking for a mate to begin their own pack. Wolves howl to communicate with other wolves, so a lone wolf has no need to howl unless they are trying to find other wolves. 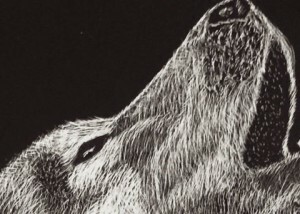 Wolves also do not howl unless they have something to say – they keep their communications honest and real. In our pack we have experienced the animals howling to say hello, goodbye, thank you, come here, “please leash me”, emergency, “let’s all get along”, “how are you doing”, “shut up coyotes”, “we’re frightened/uncomfortable/somethings wrong” and we have heard a distinctive mourning howl that is heartbreaking. If you listen, you can always understand what they are saying! Char-Lee’s Angels are on their way to living healthy, enriching lives with your help! From concrete and containment to curiosity and exploration, the Wisconsin Girls are ready for their first step at integrating into the Wolf Connection Pack. A $1,500 Matching Donation Challenge is in effect to fund their spaying and vaccinations, which are only a few weeks away. Will you be an angel to Char-Lee’s Angels? 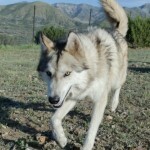 Come visit the Wolf Connection Ranch and meet your wolf pack! Visit our Event page to sign up. A small batch of the 2015 Limited Edition TShirts will be at our kiosk, don’t miss out! Congrats to Linda Goode for her winning design! The small batch of the 2015 Limited Edition TShirts will be on sale at the August Community Hike. There will be a limited supply and, once they’re gone, they’re gone. 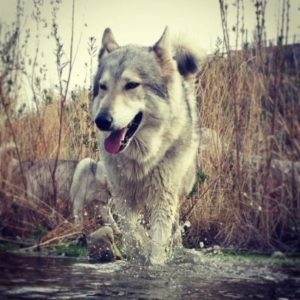 Wolf Connection’s Wish List on Amazon – Amazon makes it easy for you to purchase needed products and give directly to your pack! While you’re there, don’t forget to sign up for Amazon Smile and select Wolf Connection as your chosen charity so that a percentage of all your shopping comes to Wolf Connection, how easy!